The food industry is a key sector of the French economy, which, according to the National Association of Food Industries (ANIA), generated revenues of EUR 172 billion in 2016, up 1.1% year-on-year. The industry is generally resilient, supported by slow but steady consumption growth every year. 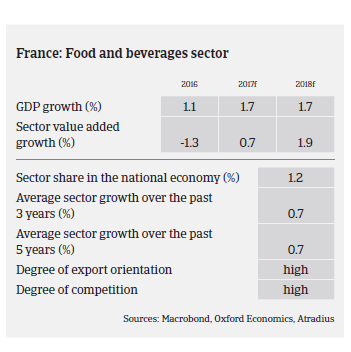 French food sector value added growth is expected to increase 0.7% in 2017, followed by 1.9% in 2018. France ranks amongst the five largest food exporters worldwide, and its food trade balance generated a EUR 7.2 billion surplus in 2016, yet down from 8.1 billion in 2015 due to a very poor wheat crop harvest and decreased prices of dairy products. The annual surpluses are mostly attributable to wine and spirits exports, while France remains the second-largest producer of wines worldwide behind Italy. According to ANIA, French food companies generate 75% of their revenues domestically. 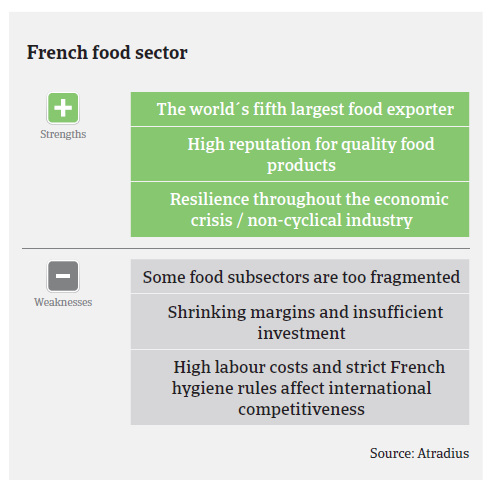 However, food producers and processors continue to face structural challenges in the French market that severely impact their margins, namely the fierce price competition in the French retail segment and contractual price-adjustment mechanisms. The ongoing concentration process of retail chains has further weakened the bargaining power of food producers and processors. At the same time French food businesses are burdened by high labour costs and taxation compared to many of their European peers. Therefore French food producers and processors are highly exposed to commodity price fluctuations and competition from abroad. In 2016 and 2017 French food processors faced strong cyclical headwinds caused by commodity price volatility. Pork prices grew 22% in 2016, triggered by increased demand from China, while salmon prices surged 60% as Norway faced production issues, and butter prices sky-rocketed by more than 150% since November 2016, due to production shortage and greater demand from China and USA. Since summer 2017 egg prices have significantly increased following the fipronil contamination scandal, putting even more pressure on the margins of biscuit manufacturers. Those price increases have resulted in a tense situation for many food manufacturers, stuck between farmers demanding higher prices while retail chains strictly refuse to increase purchase prices. Moreover, French food companies are preoccupied by Brexit and the Canada-EU Trade Agreement (CETA), which might impact the competitive environment. Despite those issues food manufacturers proved once again to be resilient last year, as food insolvencies decreased about 8% in 2016, while the agriculture sector recorded a 4% increase. Payments in the French food sector take 45-50 days on average. Despite a 1.9% growth forecast for 2018, market and trading conditions will remain challenging due to the on-going volatility of commodity prices and loss of market shares to European peers. Price increases will be difficult to pass on to retailers, sometimes leading to product withdrawal or contract termination. While pork prices are slowly decreasing, prices for butter and eggs are expected to remain high for the time being. Wine production volumes are expected to decrease, but the good quality of grapes should compensate this decline by higher sales value. The ongoing difficulties coupled with an increasing deterioration of the financial situation could lead to an increase in non-payments and insolvencies of food manufacturers in the coming months, especially in the segment of meat processors. 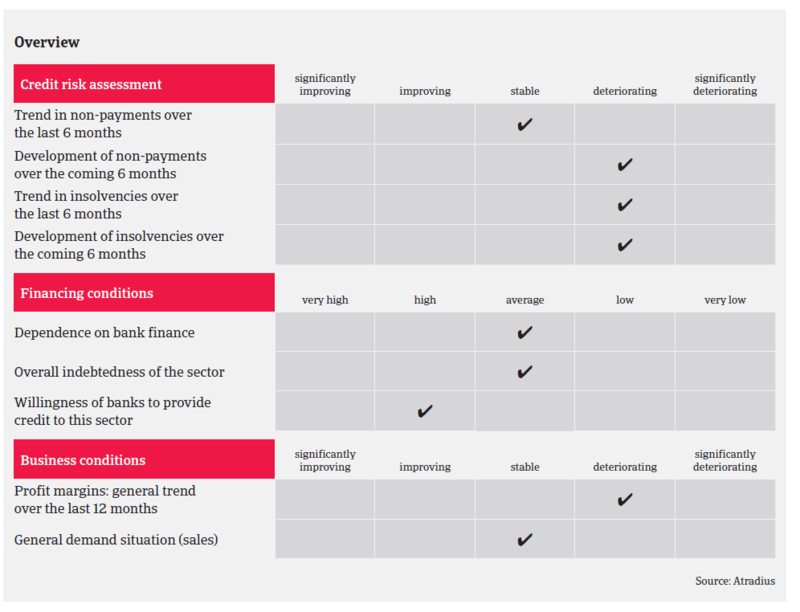 We have increased our scrutiny on the most sensitive cases, taken more restrictive decisions and overall reduced our appetite for “grey zone” businesses compared to last year. Portfolios screening and actions were also taken to identify potential sensitive cases. Additionally fraud remains an issue in the French food sector, especially in the wholesale of meat segment. We pay close attention to this problem, e.g. by scrutinising the number of credit limits that are applied for within a short period and identifying area codes were frauds are more frequent (Paris suburbs, South east of France).